After a 'residency' as a display locomotive at a designer shopping outlet in Swindon, 7819 Hinton Manor returned to the SVR in September 2018. After a little bit of cosmetic attention, it will be going on display at The Engine House, Highley and will take on the rather special role of our ‘wedding engine’, licensed for civil ceremonies. 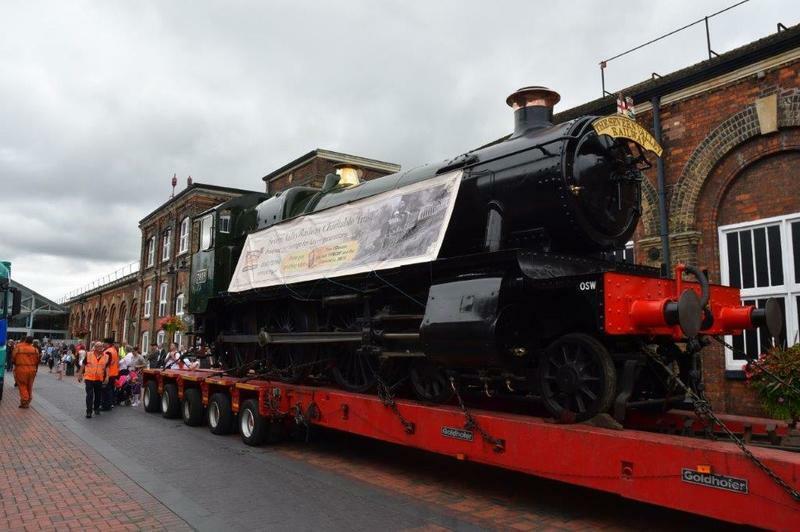 The locomotive is owned by the SVR Charitable Trust. 7819’s returns marks a huge milestone for one of the SVR’s volunteer drivers, Kev Cronin. Since his childhood, he’s been well acquainted with the loco, but by the time he was old enough to train as footplate crew, it had sadly gone out of steam. Now that it’s back and in the queue for eventual overhaul, Kev’s dream of driving Hinton Manor has moved tantalisingly closer. Hinton Manor was the last to be built in the first series of Manors to Lot 316, and was turned out from Swindon in February 1939 at a recorded cost of £4,914. 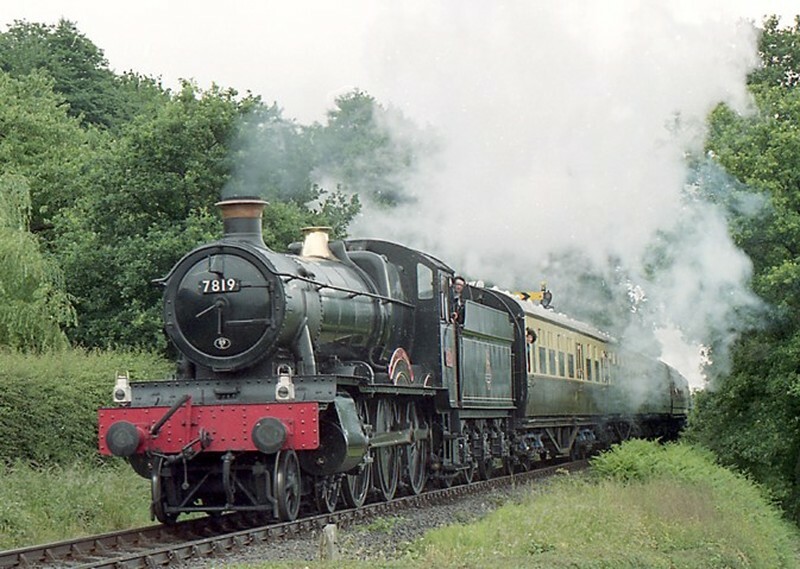 7819 went new to Carmarthen, and spent four years there before transfer to Oswestry in July 1943. Apart from a short spell at Aberystwyth in 1946, 7819 remained on Oswestry's books until 1963. During this period, the record card shows that 7819 was nominally allocated to Whitchurch from time to time. In March 1963, 7819 moved to Machynlleth and in January 1965 to Shrewsbury, being withdrawn at the end of the same year. In 1963/4, 7819 was a favourite choice for heading the Cambrian Coast Express from Shrewsbury, invariably turned out in immaculate condition with polished brightwork. Hinton was a natural choice for Royal Train duty, and with 7822 provided the power for HM The Queen's visit to Pwllheli on 10 August 1963. 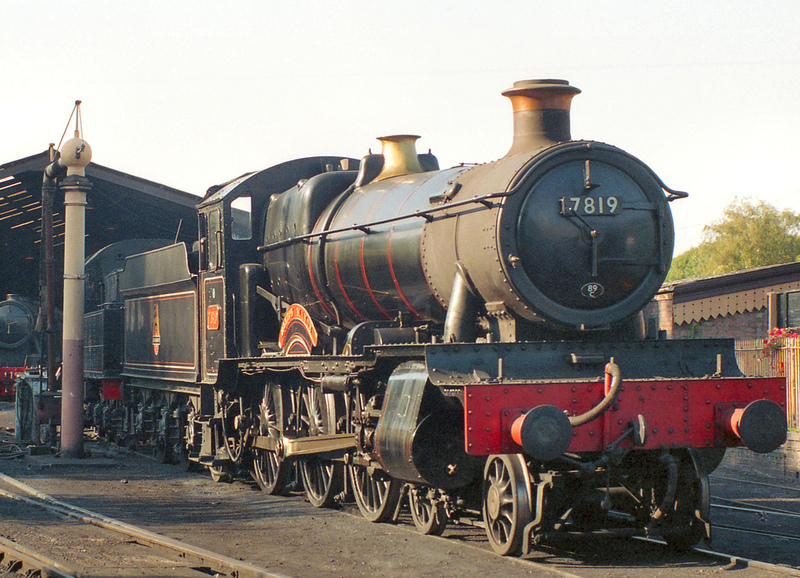 7819 spent its last year in grimy condition, and was moved to Barry for scrap early in 1966. Recorded mileage at the end of 1963 was 925,050. The locomotive arrived in Bewdley in woebegone condition in 1973, having been bought through the Hinton Manor Fund, which included SVR Company help. Restoration to running order was carried out initially at Bewdley and later at Bridgnorth, and 7819 was test-steamed in June 1977. Its debut in passenger service occurred in the late summer of 1977, and it was a prolific performer in the years that followed. Originally out-shopped in GWR unlined green, it was repainted in GWR lined green livery early in 1980 and BR lined black early in 1985. 7819 saw main line service during the GW150 celebrations in 1985, reaching Plymouth, Swindon, Avonmouth and Newport. In 1987 a brief period of Cambrian steam occurred, and the engine took a prominent part, visiting Aberystwyth and Pwllheli during the summer working the Cardigan Bay Express special service. In 1990 7819 became part of a royal train once again, conveying HRH The Duke of Gloucester from Kidderminster to Bridgnorth for the official opening of the railway's boiler repair shop. The Duke drove 7819 for part of the journey. In 1991, 7819 shared Cambrian special train duties to Aberystwyth on two Sundays in June and two in September. In the meantime, Gloucester Festival shuttles were worked on 4 August.